Kalida’s Trevor Lambert has produced on and off the court. The senior Wildcat leads the team with a 14. 5 scoring average and off the court has provided invaluable leadership along with the other seniors on the squad. KALIDA –- Kalida finds itself in familiar territory. The Wildcats are 10-5 and 4-0 in the Putnam County League with a huge game looming against Ottoville Friday. The Big Green are 3-1 in the PCL and 13-3. Most might have predicted this huge game at the onset of the season with the talent these two teams feature but Kalida’s road to the big showdown got off to a slow start. Despite returning four starters and six letter winners from a team that finished 18-7 overall before bowing out to in the district finals to Pandora-Gilboa, the Wildcats did not come out of the gate on fire. 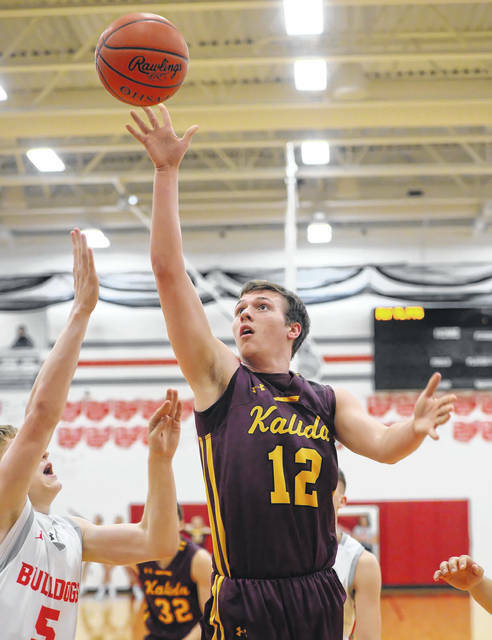 Kalida opened up its season losing two of its first three games, an overtime loss to New Bremen, followed by a win over Ada, only to fall to perennial powerhouse Archbold in week three. Kalida appeared to get things rolling after reeling off four straight wins after the loss to Archbold. But back-to-back losses to Lincolnview and Crestview showed the Wildcats had more work to do. Stechschulte said even though the Wildcats fell to the Knight it was a game where the seniors really began to step up. Since losing to the Knights have won their last five of six, losing only to Van Wert, in that stretch. While the losses were tough to swallow, Stechschulte said the team has learned from these losses. Offensively, senior Trevor Lambert leads the team in scoring with a 14.5 points per game average followed by sophomore Luke Erhart who is putting in 10.6 points a game and grabbing 5.2 rebounds a contest. Senior Grant Laudick is pumping in 6.9 points a game and Owen Recker is averaging 6.5 points a contest. Gabe Hovest is scoring 6 points a contest. Stechschulte added that the senior-laden squad is smart and had 14 players on the roster with nine or 10 of those with a 4.0 grade point average. Stechschulte said what makes these players good on the court is their versatility. Even though the Wildcats appeared to have found there stride, the Kalida head coach adds there is still plenty to work on as the season heads into the home stretch. Ottoville is one opponent Kalida is familiar with as they players cross paths numerous times in their high school careers and Stechschulte knows the team will be motivated to play in this rivalry game. “Ottoville is a rival and the kids love playing Ottoville and I think the Ottoville kids are probably saying the same think about Kalida,” Stechschulte said. “A lot has to do with the support from the towns you get on the night’s we play each other. The atmopshere is going to be great and it is easy to get up for a game like this because of the buzz in the crowd. Both teams will be ready. https://www.limaohio.com/wp-content/uploads/sites/54/2019/01/web1_CG-vs-Kalida-RP-004-1.jpgKalida’s Trevor Lambert has produced on and off the court. The senior Wildcat leads the team with a 14. 5 scoring average and off the court has provided invaluable leadership along with the other seniors on the squad.